I think that we all know just how rampant consumerism is getting in our society. Our kids watch commercials and drive the spending train of most of our families. My own children have constantly been bombarded by commercials on television, and it has affected their wants this holiday season. So, how do you combat the affect of consumerism on this season when we should be focusing on the true reason for the celebrations? When I was a little kid, my mother used to hand me a copy of the JC Penney’s Christmas Catalog and a marker every year around Thanksgiving. She would let me circle the toys that I wanted Santa Claus to bring me, and I would circle to my little heart’s content. Unfortunately, the book ended up having more circles in it than it had blank pictures. What can I say? There were a bunch of cool toys, but sadly, the problem has of course spread to my children. My children, like many, have a case of the wants that are intensified during the Christmas season, and the rampent commercials on television are not helping. 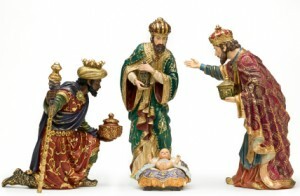 Santa Claus will only bring each child three gifts because that is how many Jesus received from the three wise men. Whether you are Christian or not is not my business, but this turned out to be a great idea for our family to keep consumerism down to a bare minimum this holiday season. I think that is a great idea and I do know a couple of people that follow that rule.